In one of those coincidences that isn’t, after seeing one of my nightmares in real life, I never had that particular nightmare again. For years, it was a recurring nightmare: a storm was coming, and it was coming specifically for me. What plans it had for me, what might happen to me if and when it successfully caught me, I never learned and I never hoped to. Where was the apartment? 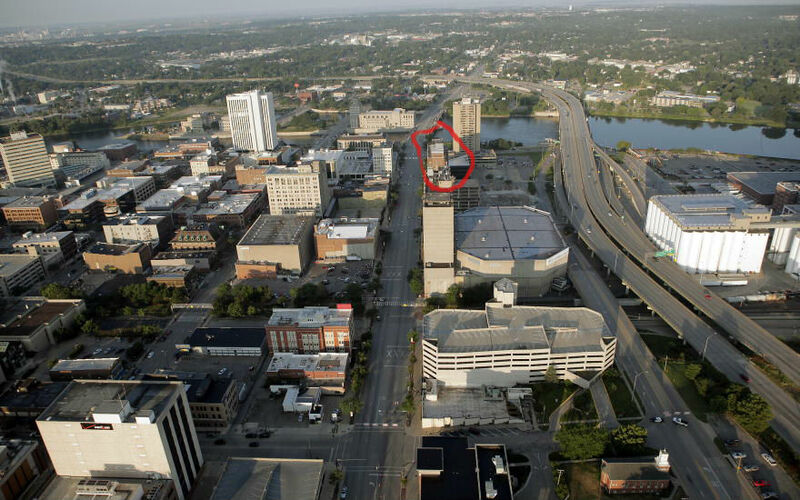 From 2000 till 2005 I lived in Cedar Rapids, Iowa, which is a great mid-sized city and to this day it is the only city in which I have lived. I have only resided in small towns, suburbs, and remote cabins before and since. Below is a photo of the apartment building in which lived in that city. 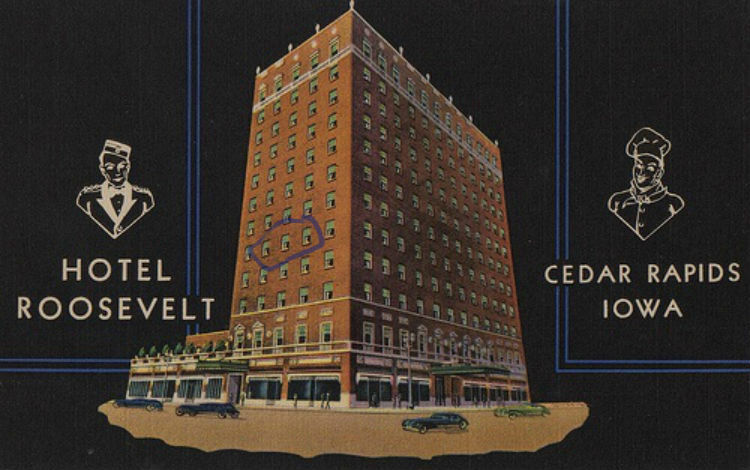 The Roosevelt was built in the 1920s (so it was named for Theodore) and was for a time one of Cedar Rapids’ two tallest buildings; twelve stories tall, it remains a part of the skyline. It began life as a ritzy hotel and it is now an apartment and office building. I have circled “my” three windows on the fifth floor; the middle window and one immediately to its right were my living room, and the window on the left was my bedroom window. There were corner apartments on either side. These are large windows, which is important to know for the anecdote; the windowsill was at mid-thigh height and the top of the windows was at the ceiling, and these apartments had 10-foot ceilings. Big windows. From my fifth floor vantage point, I gazed south-ish upon the roof of the bank across the street, a three-story tall building, and the other neighboring buildings. Three blocks away, the city’s tallest building loomed, a 20-plus-story apartment tower that I set foot in precisely once. Four blocks away, the Cedar River flowed by; my street, First Avenue, is one of three downtown streets that cross that river. I moved into my building in July 2000 and began to have weather-obsessed nightmares by August. I do not know why. Being from upstate New York, the Mid-Hudson Valley precisely, I found the Midwestern sky to be different from the skies I have always known, and storms, largely unslowed by hills or trees for hundreds of miles, whip through the region. The first topic of conversation most people brought up with me had to do with the weather and the dangers of not heeding the signs of a tornado. In the spring and fall, there were weekly tornado alarms. Someone said something to me about seeing colors in the storm clouds: basically, if you see colors in the clouds, any colors at all, seek shelter immediately. Something colorful is about to take place. The above paragraph about the frequency of weather-related conversations may explain the reason why I started to have weather-obsessed nightmares. The local network affiliates interrupted any and all programs with news of approaching storms. That fact probably explains it as well. In my dream, I would see the 20-story-tall Iowa Realty Tower, four blocks away, disappear as it was surrounded by a dark gray storm cloud as the cloud made its way north toward my building, as it made its way north toward my windows, as it made its way north toward me. In the dream, I frantically rush from window to window, fight to close my tall windows and drop the blinds, but too late. In one dream, the storm clouds actually penetrated into my apartment, fingered their way around my blinds. In the spring of 2003, it finally happened. I was out running errands and I saw colors in the dark grey storm clouds. A greenish-yellow, just like hate. I rushed home and dropped my grocery bags in my foyer and there in front of me, out my window, was the very storm cloud I had had nightmares about. It began to surround the Iowa Realty Tower as it crossed the Cedar River and proceeded north towards my building, towards my window, towards me. I actually started shaking. It pelted the windows with hail and hard rain, which is often what storms do, and then moved past. It was a strong enough storm that it in fact generated a tornado, as per everyone’s warnings about colors in the clouds. It was the first tornado to touch down in downtown Cedar Rapids in decades, as tornadoes do not easily form among tall buildings. Thus it was a tiny tornado, a cute one even, but a tornado nonetheless. It touched down in an empty parking lot. This particular nightmare left my psyche after reality outdid it. This is an re-write of a story from last fall which then re-appeared in February.